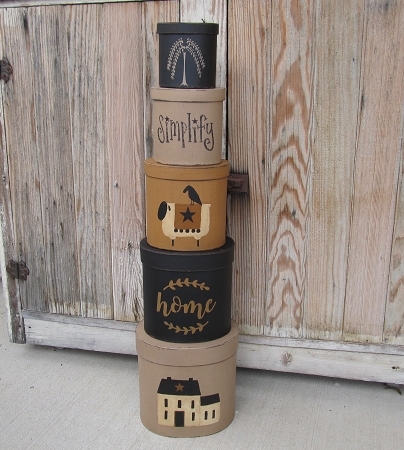 Primitive Saltbox Home Set of 5 Oval Stacking Boxes with Sheep and Willow Tree. Introductory Pricing for a Limited Time! Brand new design of stacking boxes. Love the primitive color scheme with this set. Warm Primitive Tan, Black and Olde Forge Mustard. The bottom box is painted a khaki tan color with a cream saltbox house with Mustard Star accent on the roof. The next box is Black with the word HOME with vines done in Olde Forge Mustard. The middle box is Olde Forge Mustard with my signature hand painted sheep, sporting a dark English Mustard quilt, with black accents and a crow perched on his back. The next box is khaki tan again, with the word SIMPLIFY hand written on with little stars for the dots on the "I"'s. The very top box is black again, with a khaki tan colored willow tree. Size stacked up 31" high and the bottom box is 8" wide. Each box is sanded/distressed and the piece is antiqued for the final finish. Featured in the May 2019 Country Sampler Magazine.